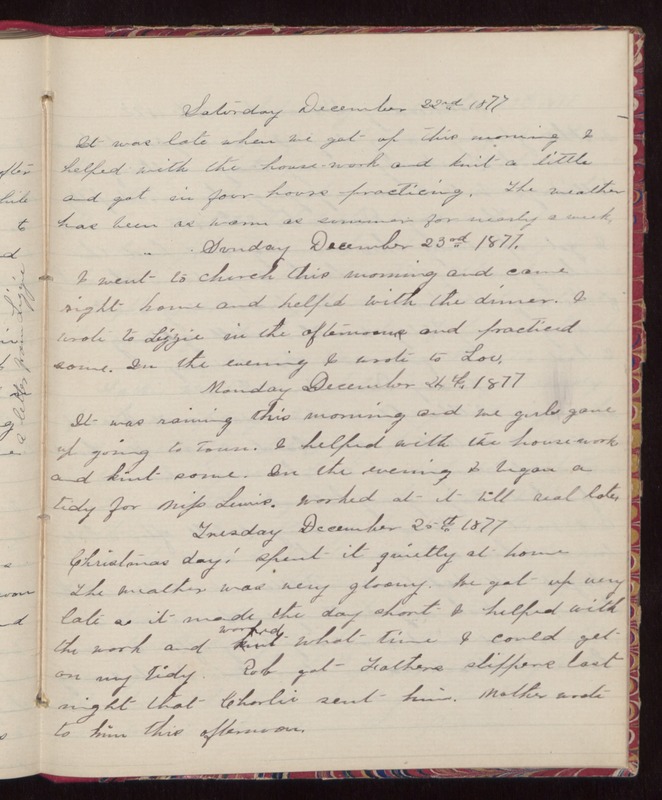 Saturday December 22nd 1877 It was late when we got up this morning I helped with the house-work and knit a little and got in four hours practicing. The weather has been as warm as summer for nearly a week. Sunday December 23rd 1877. I went to church this morning and came right home and helped with the dinner. I wrote to Lizzie in the afternoon and practiced some. In the evening I wrote to Lou. Monday December 24th 1877 It was raining this morning and we girls gave up going to town. I helped with the house-work and knit some. In the evening I began a tidy for Miss Lewis. Worked at it till real late. Tuesday December 25th 1877 Christmas day! spent it quietly at home. The weather was very gloomy. We got up very late as it made the day short I helped with the work and worked what time I could get on my tidy. Rob got Fathers slippers last night that Charlie sent him. Mother wrote to him this afternoon.